The Beauty Junkie - ranechin.com: RM200,000 Worth of Prizes to Win in ‘Balik Kampung Bersama Pensonic’! 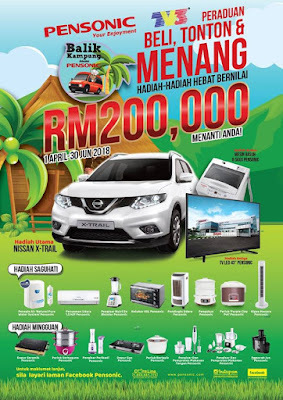 RM200,000 Worth of Prizes to Win in ‘Balik Kampung Bersama Pensonic’! Hari Raya is around the corner, it’s the time to go back to our hometown to spend quality time with our family and loved ones. This year, why not win some amazing prizes and present it to our loved ones by joining ‘Balik Kampung Bersama Pensonic’ Campaign by Pensonic. 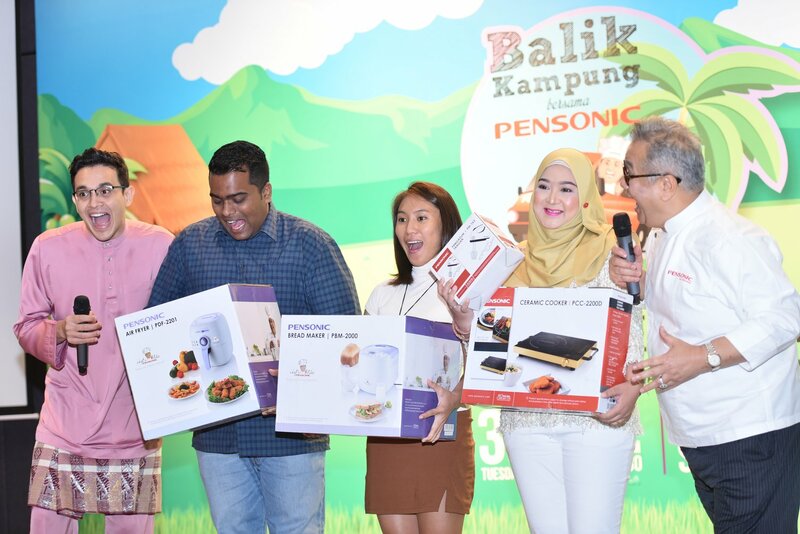 Pensonic has launched its ‘Balik Kampung Bersama Pensonic’ Campaign with more awesome rewards to thank its consumers for their support. 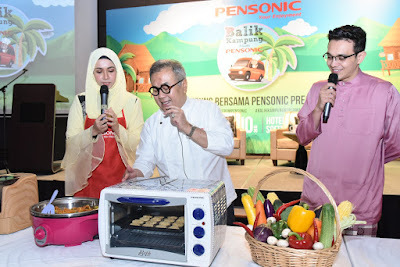 The previous, hugely popular, yearly Chef’s Like Campaigns were a feast for consumers as there were many exciting activities such as fun cooking classes with Celebrity Chef Dato Chef Haji (DCH) Ismail, ‘Raya Merdeka Bring Chef Home’ contest, ‘Chef Mail Masak Bersama Pensonic’ cooking programme and lots of Watch & Win contests. The 3rd season of the ‘Chef Mail Masak Bersama Pensonic’ programme, even though aired only on TV3, managed to reach a viewership of more than 6.3 million. 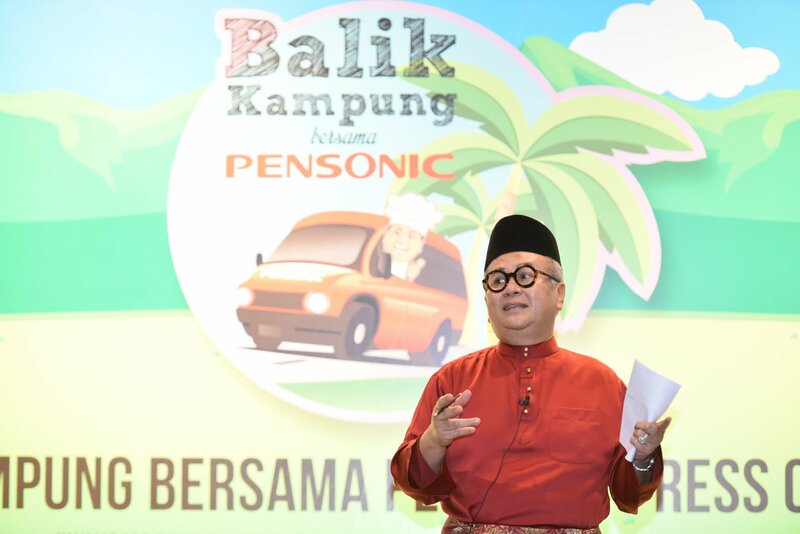 This year, an exciting brand new programme, ‘Balik Kampung Bersama Pensonic’ will air on Mondays at 6.00pm, starting 30 April 2018. 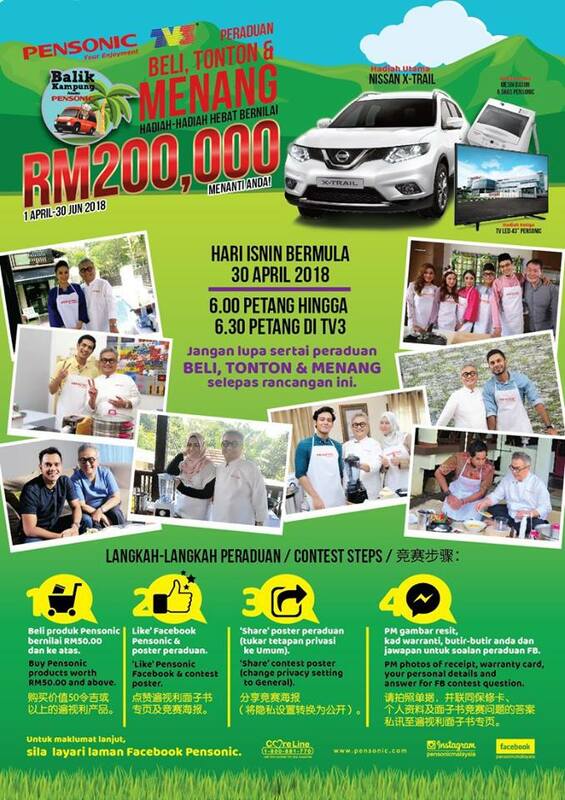 Join the Buy, Watch & Win Contests after watching the 8 episode weekly programme for a chance to win RM200,000.00 worth of prizes including a Nissan X-Trail and Pensonic home products from 1 April to 30 June 2018. Buy Pensonic products worth RM50.00 and above in a single receipt. 'Like' Pensonic Facebook & contest poster. ‘Share’ contest poster (change privacy setting to General). Watch ‘Balik Kampung Bersama Pensonic’ on TV3. PM photos of receipt, warranty card, your personal details and answer to FB contest question. Consumers are encouraged to follow Pensonic Facebook for the latest contest updates. Do follow Pensonic Facebook to find out about the complete list of Special Prizes that will be posted on the page soon. Buy, Watch & Win contest questions will be posted on Pensonic Facebook after the ‘Balik Kampung Bersama Pensonic’ programme on TV3 every Monday at 6.00pm, starting 30 April 2018. The ‘Balik Kampung Bersama Pensonic’ programme has 8 episodes where 10 winners will be chosen for each episode, therefore a total of 80 winners for all 8 episodes. We will mention the weekly prizes on the Buy, Watch & Win contest poster. 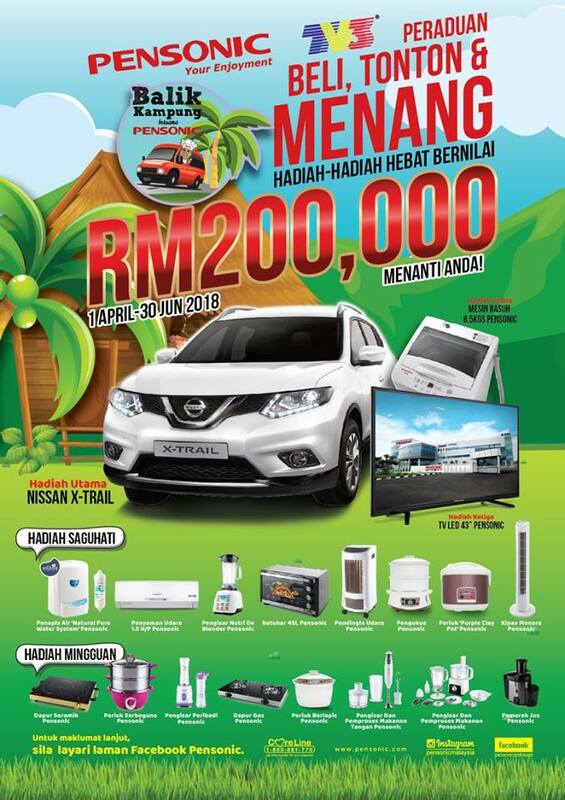 If you join the Buy, Watch & Win weekly contests but don’t win any prizes, no worries because you and weekly winners will still be considered for an opportunity to join the Pensonic Facebook LIVE Grand Final contest on 21 July 2018 to win more prizes and a Nissan X-Trail Grand Prize worth RM137,000.00! 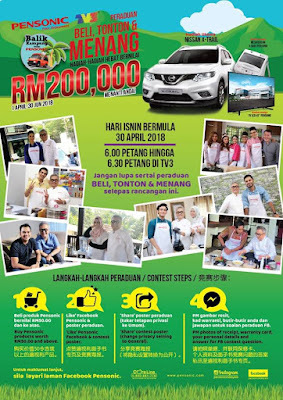 In addition to the opportunity to win the main prizes, weekly prizes and learning the mouthwatering recipes that will be demonstrated in this programme, these local artistes, together with your favourite Chef Dato Chef Haji Ismail, will certainly have you glued to your seats every Monday at 6.00pm. The hot, local artistes appearing in this programme are Hafidz Roshdi, Farah Nabilah, Fikry Ibrahim, Nadia Amira Othman, Ashraf Muslim, Alif Satar, Nur Risteena Munim Binti Zainul Ilyas, Nur Ruhainies Farehah Binti Zainul Ilyas, Ika Nabila binti Abdul Rahim, Erwin Dawson and YB Khairy Jamaluddin Abu Bakar. 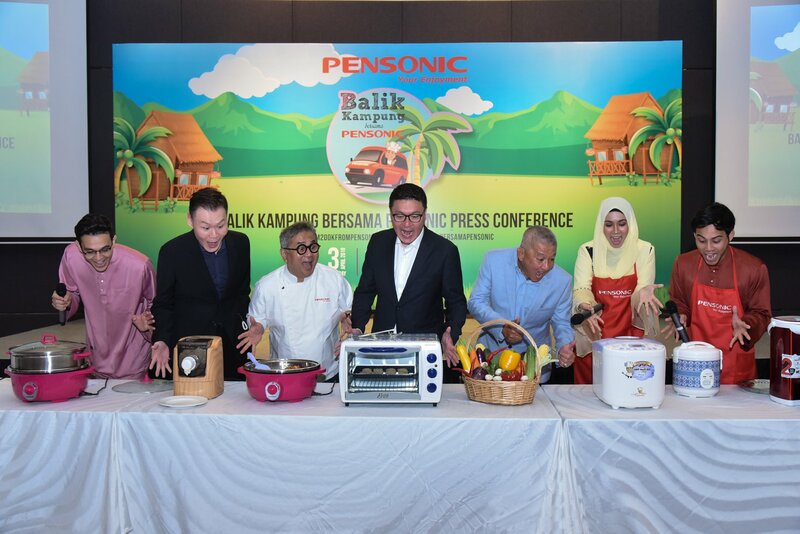 This time, ‘Balik Kampung Bersama Pensonic’ programme captures the traditional essence of ‘Balik Kampung’ or going home for Hari Raya. DCH Ismail will ‘Balik Kampung’ together with the celebrities to their parents’ houses, where they reminisce about their Hari Raya memories and cook the traditional dishes that they enjoyed during their childhood. “Pensonic products are all about enjoying life to the brim and helping you to spend quality time with people who matter in your life, especially your family. Nothing beats cooking your own meals and sharing them with your family and friends, and that’s why we want you to have fun when you cook. DCH Ismail’s recipes in the ‘Balik Kampung Bersama Pensonic’ programme and ‘Balik Kampung Bersama Pensonic’ Live Cooking Classes, together with Pensonic products will definitely make cooking a delightful experience”, said Pensonic Group Executive Director Mr.Nelson Chew. He added, “This year too, we are collaborating with dealers to have ‘Live Cooking Classes’ at selected locations throughout the nation. More information will be posted on the locations of the Live Cooking Classes on Facebook, so follow us on Pensonic Facebook to get updated information. Each participating team in the Live Cooking Classes get to take home the delicious dishes they have cooked during the cooking class, plus RM450.00 worth of gifts including a Pensonic Multi Cooker! 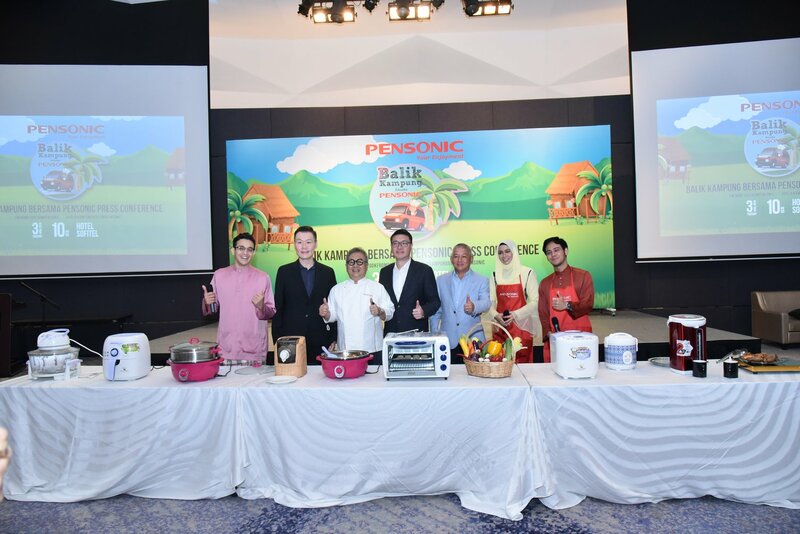 Pensonic, together with DCH Ismail, want Malaysians to enjoy wholesome, home cooked meals, quality family time and a healthy life. The recipes in their programmes are easy to prepare, using ingredients that are commonly available in most Malaysian households. DCH Ismail’s enthusiasm, delicious recipes and cooking made easy using Pensonic products, will surely inspire you to whip up your own gourmet meals in no time! It is highly recommended that you spend some time watching our cooking programme. You will learn how to cook like a chef, as well as have an opportunity to win fantastic Pensonic products for your home by joining their Facebook Buy, Watch & Win Contest. With Pensonic products in your home, enjoy the simplicity of a marvelous, well cooked meal and let the good times roll!